One of the best parts of being an author is reading other authors’ books before they’re published — and sometimes being asked for an endorsement (a compliment, indeed). 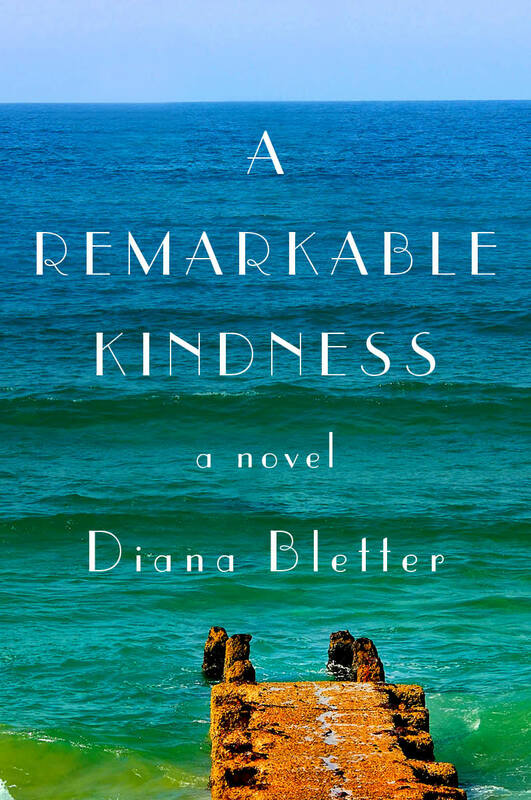 Such was the case with Diana Bletter’s A Remarkable Kindness. This story — and Diana’s story — are indeed, remarkable. Please welcome Diana to WFW! Why is writing so exthrillerating? Because we can take 26 letters (there are 26, right?) and make words line up in perfect order, or fall in place topsy-turvy, or even make up our words, like exthrillerating. In my novel, A Remarkable Kindness, one of the four main characters, Rachel, invented that word with her high school friend. It’s a powerhouse combo of thrilling and exhilarating and it sums up my feeling exactly about writing this novel. It’s a privilege for me to write about four women friends. Some writers (presumably male) might say that I’ve relegated myself to a sub-category or run the risk of cutting my potential readership in half. If I had written about four male friends who belonged to a burial circle (more on that in a minute) my novel would be viewed as more encompassing. We all know that man is the first syllable of mankind. A man can stand for humanity whereas women stand for ourselves. A book about women might not be as appealing to general audiences. It’s obvious that if the series had been called Harriet Potter, it wouldn’t have been so astoundingly successful as what it is now: one young boy’s fight against evil. Speaking of Harriet, it was Harriet the Spy who introduced me to the idea that I could think of myself as a writer and far more importantly,act like one. Harriet taught me to always, always carry around a notebook and a pen to observe, observe, observe. I’ve learned that what I perceive is valuable. Throughout history, women’s perceptions have been discounted or invalidated. (See Freud, Jung, et al.) We are lucky to live in an era when women don’t have to call ourselves George or Currier to get published. We can be unabashedly women, proudly writing about our own observations and experiences. A Remarkable Kindness, is about four women who are members of a burial circle in a small beach village in northern Israel. To explain: in 1991, I moved from New York to a village quite similar to the one I’ve invented in my book. The village, founded in 1938, has about one thousand residents. There is a cemetery and a small burial house which serves as the funeral parlor. In keeping with ancient Jewish traditions (picture the shroud of Turin) men prepare and dress a deceased man for burial; women take care of the women. This ritual, called a tahara, has an order to it; there are special, simple clothes, as well as lovely prayers. I happen to be a member of the burial circle in real life. The word I’d use to describe it? Reverent. One of the novel’s characters, Lauren, is a maternity nurse. She reflects on her great privilege being a witness to the two “bookends of existence,” birth and death. She is surprised to learn that rather than feeling morbid or struck with a depressing sense of mortality after the ritual, she is filled with a craving for life. The same feeling happened to me with a jolt one specific time after I participated in this ritual. I was aware of the beauty all around me (from the cemetery you can hear the rise and fall of the Mediterranean Sea) and I thought, Wow, I have to write about how life-affirming and wonderful this ritual is. Maybe I’ll write about four women friends who are members of the burial circle. Maybe they’ll talk about life and death. Maybe they’ll reflect on their children, their mothers, their husbands, and…. A Remarkable Kindness took a lot of years, on and off, to write. Life often got in the way as I suppose it does more often to women than to men. (Ah, to have a magic wand perform the shopping, cleaning and cooking.) My husband, Jonny, and I have a blended family of six children, three boys and three girls, and I venture to say (no excuses) that if I hadn’t been carpooling, pairing socks and paring vegetables, I probably would have been able to crank out a few more paragraphs. But I’ve had the chance not only to write my best chapters but live them, too. And if I’ve learned anything from the novel’s characters—Aviva, Lauren, Emily and Rachel—it’s this: We must really live our lives this time around. We only get one chance. Diana Bletter’s writing has appeared in a wide variety of publications, including The New York Times, The Wall Street Journal, Family Circle, Glamour, and Commentary. She is the author of The Invisible Thread: A Portrait of Jewish American Women, with photographs by Lori Grinker, nominated for a National Jewish Book Award, and the memoir, The Mom Who Took Off on Her Motorcycle. A native New Yorker and a graduate of Cornell University, Diana lives in a beach village in northern Israel with her husband and children, and volunteers in a burial circle. Yes, life does have that nasty habit of getting in the way of writing, but then again, we would be far poorer in mind and spirit (and fodder for stories) if it did not. And, though I haven’t made up any words, that I know, I have profited by discovering the beauty of so many existing ones. Very true, Rona. Having a lot of experiences is truly living…and then we have stories to write about. Thank you for reminding me that learning old words (and using them in our writing) is as important as making up new ones! I saw your book on Goodreads and was immediately intrigued. What a fascinating ritual — and even better that you’ve shared that personal experience with us through your fiction. Yes, women are complicated, giving, always-going creatures. That stories about men seem to be given more credibility will always be a mystery to me. Had to laugh at your “Ah, to have a magic wand perform the shopping, cleaning and cooking” comment. I feel that way, myself, many days. Thank you for sharing some background behind your story! Thank you Melissa. It is good to laugh at ourselves, right? And of course, the pen is ALWAYS mightier than the sponge…so when it comes to housework, you know where I stand. Hope you enjoy A Remarkable Kindness! I just want to thank Amy Sue Nathan for doing such a wonderful job with this blog and creating a community of writers and readers. Thanks again! Sounds fabulous! I’m going to have to add it to my ever tumbling TBR. This is such an interesting interview. The book sounds fascinating. THX!